German gun-launched missile. The V-3 Hochdruckpumpe (aka HDP, 'Fleissiges Lieschen'; 'Tausend Fussler') was a supergun designed by Saar Roechling during World War II. The 140 m long cannon was capable of delivering a 140 kg shell over a 165 km range. Construction began of a bunker for the cannons in September 1943 at Mimoyecques, France. The site was damaged by Allied bombing before it could be put into operation and was finally occupied by the British at the end of August 1944. Two short-length (45 m long) V-3's were built at Antwerp and Luxembourg in support of the Ardennes offensive in December 1944. These were found to be unreliable and only a few shots were fired without known effect. AKA: HDP;Tausend Fussler. Status: Cancelled 1944. Payload: 140 kg (300 lb). The V-3 used Baron von Pirquet's concept of sequentially electrically activated angled side chambers to provide additional acceleration of the shell during its passage up the barrel of the gun. This allowed a muzzle velocity of over 1500 m/s. The projectiles of the smooth bore weapon used fins for stability, as would be the case with the Canadian Martlet series 25 years later. Lyman and Haskell of the US Army had built an unsuccessful prototype of the concept in the 1880's. It was found that the expanding gases of the base charge moved well ahead of the shell and ignited the auxiliary charges before the shell passed them, actually slowing the shell down. But in 1941 an engineer Conders at Saar Roechling proposed the use of electrically-activated charges to eliminate the problem. A 20mm prototype was built at a test site at Misdroy (Miedzyzdroje), Poland and successfully demonstrated in April-May 1943. Hitler was persuaded that this could be a third terror weapon to supplement the V-1 and V-2. Overruling the German military, he ordered fifty of the guns to be built in concrete bunkers in France in order to bombard London. 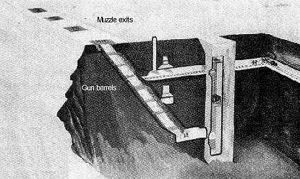 The first installation of five guns was to be built 165 km from London at Mimoyecques, near Calais, under Operation Wiese. The superguns were built at a fixed angle into a 30 m chalk hill, covered by a 5.2 m thick protective concrete dome. Each 140 m long cannon was capable of delivering a 150 mm / 140 kg shell on London. The angled lateral combustion chambers were spaced every 3.65 m along the bore. The modular weapon could have the lateral chamber sections replaced as they wore out (they would burst after only a few firings). Hundreds of slave workers began construction in September 1943 by sinking an initial tunnel 30 m below the hill's surface into the chalk. French Resistance informed the Allies of the new effort almost immediately. Bombing raids to destroy the site began two months later. However the bunker proved impervious to Allied bombs, even 5400 kg Tallboy penetrator weapons. The weapons were nearing completion when, on 6 July 1944, three Tallboys happened to make it though the gun shaft openings. They penetrated 30 m to the first level of the complex and exploded, killing dozens of workers. Work on the complex stopped at this point. The Allies were unaware of this success and searched for new methods to destroy Mimoyecques and other German bunker sites. Under Project Aphrodite (USAAF) and Operation Anvil (USN) radio-controlled, television-guided B-17 or PB4Y (B-24) bombers crammed with ten metric tons of explosives were to be flown by a crew near to the target. The pilot and co-pilot would then bail out while an accompanying aircraft guided the missile to a precision strike. This approach was abandoned in August 1944 after a total lack of success and several crew fatalities (including Joseph P Kennedy, Jr, elder brother of the future president). By the end of August the Germans completely abandoned the complex in the face of the advancing British forces. Two short-length (45 m long) V-3's were built at Antwerp and Luxembourg in support of the Ardennes offensive in December 1944. These were found to be unreliable and only a few shots were fired without known effect. The British dynamited the Mimoyecques complex on 9 May 1945. Maximum range: 165 km (102 mi). Family: Gun-launched. Country: Germany. Agency: Saar Roechling. Bibliography: 461, 693. 1941 - . Launch Vehicle: V-3. The V-3 Hochdruckpumpe supergun conceived - . Nation: Germany. 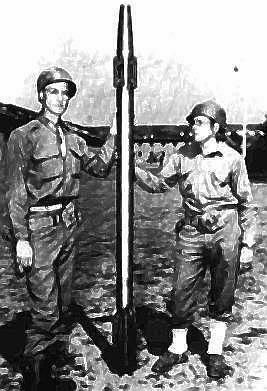 Coenders at Saar Roechling proposed the concept of sequentially electrically activated angled side chambers to provide additional acceleration of a shell during its passage up the barrel of the gun. This allowed a muzzle velocity of over 1500 m/s. A 140 m long cannon using this concept would be capable of delivering a 140 kg shell over a 165 km range. Funding is finally obtained to build a subscale prototype. April-May 1943 - . Launch Vehicle: V-3. V-3 tests. - . Nation: Germany. Related Persons: Dornberger, Hitler. 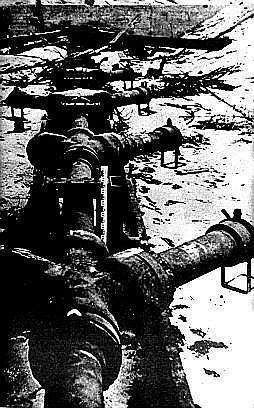 The V-3 cannon was tested at Misdroy on Wollin Island (now Miedzyzdroje, Poland). The gun was a 60 m long constant-pressure cannon developed by Coenders of the Roechling firm in Saarbrucken. The gun was laid at a 45 degree angle in the dunes. Aiming was accomplished by arranging wood blocks under the concrete sections. The gun demonstrated a 15 km range with a sabot-launched, arrow-shaped warhead. The tests were conducted under Kammler, who was responsible for all V-weapons. Dornberger had been opposed to the concept, but everyone else was enthusiastic, due to Hitler's support and unending fascination with artillery. September 1943 - . Launch Vehicle: V-3. V-3 in launch bunkers under construction at Mimoyecques, France. - . Nation: Germany. 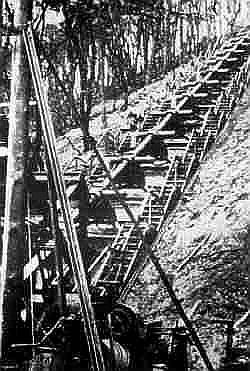 The operational version being built in the chalk cliffs of France used 4 to 5 m long T-shaped sections, assembled to a total length of 150 m, and capable of shooting shells over a 170 km range. However it took a large number of reloaders to put powder in each T-arm after a shot - the planned weapon could only be fired once every five minutes. Furthermore every third shot caused the barrel in one of the T-sections to crack, meaning it had to be removed and replaced. Bunkers in the Pas de Calais were being built for the weapon, but they were subject to incessant bombing and finally overrun by Allied troops before they could be completed. 1944 July 6 - . Launch Vehicle: V-3. V-3 complex at Mimoyecques irreparably damaged by Allied bombers - . Nation: Germany. Three 5400 kg Tallboy penetrator bpmbs went down the gun shaft openings, reached 30 m, and exploded, killing dozens of workers. Work on the complex stopped at this point..
January 1945 - . Launch Vehicle: V-3. V-3 in action. - . Nation: Germany. Apogee: 30 km (18 mi). Range: 60 km (37 mi). Two shortened test versions of the gun with a 60 km range were used to bombard Antwerp and Luxembourg. Only a few shots were accomplished before the barrels blew up..
1945 May 9 - . Launch Vehicle: V-3. V-3 complex at Mimoyecques blown up by British Forces - . Nation: Germany. The action was taken to prevent the French from using the facility against Britain at some future date..